Three main tributaries of the South Platte River drain South Park. They include the Middle Fork, South Fork, and Tarryall Creek. Five different reservoirs have been constructed at various points along these tributaries, providing a wealth of stream and lake fishing in the area. Public access includes the 43 areas described below. 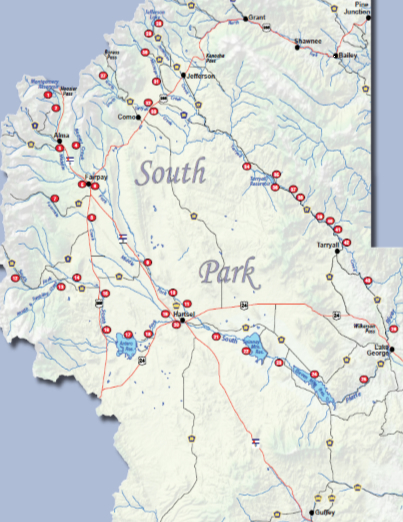 Eight of these areas are reserved for fly-fishing only and require reservations and access fees. Other streams are reserved for overnight guests only. Note: The fishing areas described here are based on information available at the time of publication. Some areas may be closed in the future due to changes in land ownership or management objectives. Contact the Park County Recreation Office in Fairplay with questions about specific fishing areas. 1) Montgomery Reservoir – Scenic mountain reservoir with stocked rainbows provides good shore fishing (only). As an option, the small stream above the reservoir contains brookies up to 10 inches. Access on foot or 4WD vehicle (only) above the reservoir. 2) Alma State Wildlife Area – About two miles of public stream access along County Road 4 between Montgomery Reservoir and Alma. Resident browns and brookies (6-14 inches) in the river and beaver ponds. This stream is small and brushy. 3) Alma Fishing Easement – One mile of public stream access on the Middle Fork of the South Platte, from Mosquito Pass Road (CR 12) upstream to the town of Alma. Good fishing for wild browns and a few rainbows on this small river. Anglers must stay within 20 feet of the banks due to private property. Mountain Comfort B&B offers lodging within walking distance of this public fishing area. 4) Beaver Creek – Small brushy stream and beaver ponds with small brookies. Several miles of public water in the Pike National Forest along County Road 659. This stream is on private property from Fairplay up to the National Forest boundary. 5) Fairplay Beach Recreation Area – Access from Fairplay or from U.S. 285 south of town. Stocked annually with rainbow trout with resident fish up to 18 inches in the reservoir and river; larger browns during late summer and fall. Other features include a paved picnic area, fishing dock and restrooms. Four different lodging options are within walking distance of this public facility. Boats are not permitted. 6) Riverside Inn Hotel – Fishing pond is stocked annually with rainbow trout for hotel guests. Fairplay Beach Recreation Area is also near the Hotel (see above). Call (719) 836-0600 or visit www.riversidefairplay.com to make a reservation. 7) Upper Fourmile Creek – Small brushy stream and beaver ponds in the Pike National Forest with browns and brookies up to 12 inches. From U.S. 285, take Fourmile Creek Road (CR 18) about five miles west to the National Forest boundary. Public fishing from here to Four Mile Campground, three miles upstream. 8) Fourmile Creek Ranch (South Park Fly Fishers) – One mile of private stream containing resident browns and rainbows up to 15 inches. Limited to two fly rods (only) per day. Reservations and daily access fee are required. Visit www.southparktrout.com for more information. 9) Tomahawk Ranch State Wildlife Area – Over five miles of public fishing access along the Middle Fork of the South Platte, above and below the old town site of Garo on Colorado Highway 9. Gold Medal Water containing resident browns and rainbows up to 18 inches with spawning browns up to 36 inches during fall. 10) Santa Maria Ranch (South Park Fly Fishers) – One mile of private Gold Medal Water at the end of County Road 439 north of Hartsel. Resident browns and rainbows up to 24 inches. Larger spawning browns during fall. Limited to three fly rods (only) per day. Reservations and daily access fee are required. Please visit www.southparktrout.com for more information. 11) Badger Basin State Wildlife Area – Public access to the Middle Fork along County Road 439 north of Hartsel. Gold Medal Water containing wild browns up to 18 inches; larger browns during fall. Separated from Tomahawk Ranch SWA by Santa Maria Ranch (see above). 12) Weston Pass – Several miles of public fishing access on the South Fork of the South Platte along County Road 22 above Weston Pass Campground. Abundant brookies (5-10 inches) in this small stream and beaver ponds. 13) Rough & Tumbling Creek – Lower section is accessed from Forest Roads 430 & 432 off Weston Pass Road for browns up to 15 inches. Upper section requires a one mile hike from Rich Creek trailhead on Weston Pass Road for small brookies. 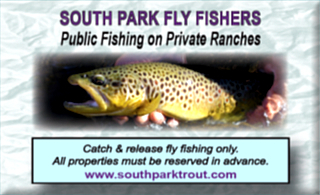 14) DM Ranch - (South Park Fly Fishers) – Three miles of private river on County Road 22 west of US Highway 285. Browns and rainbows up to five pounds in stream and beaver ponds. Limited to four fly rods (only) per day. Reservations and daily access fee are required. Please visit www.southparktrout.com for more information. 15) Knight-Imler State Wildlife Area – Slow, meandering stream with fair habitat. Seasonally good fishing for wild browns up to 15 Inches. Larger browns during fall. 16) Antero and 63 Ranch State Wildlife Areas – Seasonally good fishing for wild browns up to 15 inches on the South Fork above Antero Reservoir. Large browns migrate upstream from the reservoir during September and October. 17) Antero Reservoir – One of the most productive reservoirs in Colorado for large rainbows, browns and cutbows. Fishing is allowed from shore and small boats. According to Colorado Parks & Wildlife, trout gain 1-2 pounds every year in this shallow lake. Camping and picnicking facilities are provided on the south side. 18) Antero State Wildlife Area below Antero Reservoir – Poor stream habitat improves with distance below Antero dam. Summer water temperatures and fishing quality are controlled by releases from the reservoir and are quite variable. 19) Lower Fourmile Creek – Part of Badger Basin State Wildlife Area, lower Fourmile Creek offers small stream fishing for wild browns in the meadow near Highway 9, northwest of Hartsel. A few larger browns migrate here to spawn in the fall. 20) Badger Basin State Wildlife Area – Parking area is provided near the intersection of Highways 9 and 24 west of Hartsel. This section of the South Fork is a slow, meandering river with a few deep pockets that hold fish. Seasonally good for browns and rainbows up to 15 inches but the water gets very warm during summer. 21) Upper Spinney Mountain Ranch State Wildlife Area – Several access points to Gold Medal Water along County Road 59 between Hartsel and Spinney Mountain Reservoir. Very good fishing with resident brown trout up to 18 inches. Larger cutthroats and browns migrate upstream from the reservoir to spawn. 22) Spinney Mountain Reservoir – Seasonally excellent fishing with flies and lures (only) for large trout and pike. Fishing is allowed from shore and small boats. Special regulations apply in this Gold Medal Water. A State Parks pass or daily fee is required. The Chaparral Park General Store offers guided fishing, lodging, RV camping, boat rentals, and equipment near the reservoir entrance. Call (719) 748-0308 or visit www.chaparralparkgeneralstore.com for more information. 23) Charlie Meyers State Wildlife Area – Known locally as the ?Dream Stream,? the Middle Fork below Spinney Mountain Reservoir consistently produces large browns, rainbows and cutbows. This is catch-and-release Gold Medal Water and all fish must be released immediately. Excellent river fishing between Spinney and Eleven Mile Reservoirs but often crowded during summer. 24) Eleven Mile Reservoir – This Colorado State Park offers great shore and boat fishing for trout and pike, as well as campgrounds, hiking trails and other facilities. Ice fishing is very popular during winter. Snagging kokanee salmon is allowed during fall. 11-Mile Marina offers boat/equipment rentals and guided fishing trips upon request. Call (719) 748-0317 or visit www.11milesports.com for more information. 25) Elevenmile Canyon – Several miles of public fishing access along County Road 96 between Lake George and Eleven Mile Reservoir. Wild browns and rainbows up to 30 inches. The upper two miles are catch-and-release only. Daily vehicle access fee is required at entrance station near Lake George. Often crowded during summer. 26) Happy Meadows Campground – US Forest Service Campground on County Road 77, three miles north of Lake George. Fishing is fair to good for wild browns and stocked rainbows in the South Platte River. This campground is popular with anglers on summer weekends. 27) North Tarryall Creek – Very scenic area below Boreas Pass Road. Small stream and beaver ponds with abundant brookies above Selkirk Campground. From Como take County Road 33 to Forest Road 801. 28) Jefferson Lake – This scenic mountain lake is stocked with rainbows and hefty lake trout (mackinaw) also inhabit its depths. Fishing is best from a small boat but shore fishing is also popular. Jefferson Lake is thought to be one of the deepest in Colorado. 29) Jefferson and West Jefferson Creeks – Small, brushy streams and beaver ponds contain small brookies along County Road 37 northwest of Jefferson. Hike-in fishing option along West Jefferson Creek (Trail #643) from Jefferson Creek Campground. 30) Michigan Creek – Limited public fishing access at Michigan Creek Campground on County Road 54 northwest of Jefferson. Browns and brookies up to 12 inches. 31) Teter-Michigan Creek State Wildlife Area – Brushy creek along County Road 35 west of Jefferson. Meandering stream with deep pools and beaver ponds harbor browns up to 16 inches. Two miles of public water receives relatively little use. 32) Cline Ranch State Wildlife Area – About 2.5 miles of free public fishing access on Tarryall Creek. Wild brown trout up to 16 inches in meandering stream and beaver ponds. Limited to four parking spaces; each is assigned a different ?fishing beat.? 33) Tarryall Creek Ranch (South Park Fly Fishers) – Three miles of private river on two different properties near Como. Wild brown trout up to 18 inches in stream and beaver ponds. Limited to six fly rods (only) per day. Reservations and daily access fee are required. Please visit www.southparktrout.com for more information. 34) Tarryall State Wildlife Area – About one mile of public fishing access above Tarryall Reservoir along County Road 77. Seasonally fair fishing for resident browns and stocked rainbows. Poor habitat was improved by stream enhancement project. 35) Tarryall Reservoir – Managed by Colorado Parks & Wildlife, this small reservoir is seasonally productive for rainbows, browns and pike. Free camping and picnicking facilities are provided around the lake. Ice fishing is popular in winter. 36) Reservoir Spillway – About 300 yards of public fishing access below the spillway of Tarryall Reservoir offers good fishing for resident browns and stocked rainbows up to 15 inches. This small public area gets very crowded during summer. 37) Tarryall L&C Ranch ? (South Park Fly Fishers) – One mile of private stream containing large browns and rainbows in numerous pools and pockets. Limited to four fly rods (only) per day. Reservations and daily access fees are required. Please visit www.southparktrout.com for more information. 38) Ute Creek Trailhead – Public fishing for a short distance up and down stream of the footbridge. This section of Tarryall Creek contains wild browns and stocked rainbows up to 15 inches but public access is very limited (please do not trespass). 39) Allen Creek Ranch (South Park Fly Fishers) – Over one mile of private stream containing resident browns and rainbows up to 24 inches. Limited to three fly rods (only) per day. Reservations and daily access fees are required. Please visit www.southparktrout.com for more information. 40) Historic Williams Ranch (South Park Fly Fishers) – Two miles of private stream containing resident browns and rainbows up to 24 inches. Limited to four fly rods (only) per day. Reservations and daily access fees are required. Please visit www.southparktrout.com for more information. 41) Twin Eagles Trailhead – Limited fishing access at Twin Eagles Trailhead along County Road 77. Resident browns and stocked rainbows up to 14 inches. 42) Spruce Grove Campground – About one-half mile of public fishing access at Spruce Grove Campground along County Road 77. Resident browns and stocked rainbows up to 14 inches. Daily parking fee is required. 43) Puma Hills River Ranch – Private guest ranch on County Road 77 near Lake George offers 1.5 miles of private river fishing on Tarryall Creek for overnight guests only. Stream contains wild browns and stocked rainbows. Call (719) 748-8278 or visit www.pumahillsriverranch.com for lodging information and current fishing conditions.